Consumerization trends like BYOD have made device locking and wiping a priority, but device security is only a small piece of the enterprise mobility puzzle. To become truly secure–and productive–enterprises must broaden their scope to encompass a wider range of mobile issues, including application procurement, testing and validation, distribution, monitoring, and retirement. 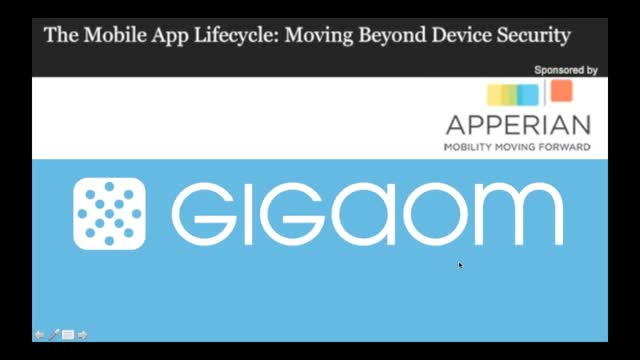 In this GigaOm webinar, the panelists will examine the policies and procedures necessary to provide comprehensive, holistic mobility management. It will review the costs and benefits of building a comprehensive enterprise mobility platform, and discuss the future of management tools. -What is Enterprise Mobility Management? -What are the limits of device-level security? -What can we learn from other device and application management paradigms? -What processes and tools are necessary? -What is the future of Enterprise Mobility Management? In this back-to-basics Fibre Channel webinar, we’re going to be talking about one of the most fundamental functions of the protocol and what makes it so reliable, predictable and secure: Zoning. The ability to ensure that end devices are able to communicate only with the set of devices explicitly permitted is part of what makes Fibre Channel so powerful. This ability to secure those connections in zones adds built-in security to these connections. Traditionally, much of the IT infrastructure that we’ve built over the years can be divided fairly simply into storage (the place we save our persistent data), network (how we get access to the storage and get at our data) and compute (memory and CPU that crunches on the data). In fact, so successful has this model been that a trip to any cloud services provider allows you to order (and be billed for) exactly these three components. We build effective systems in a cost-optimal way by using appropriate quantities of expensive and fast memory (DRAM for instance) to cache our cheaper and slower storage. But currently fast memory has no persistence at all; it’s only storage that provides the application the guarantee that storing, modifying or deleting data does exactly that. Memory and storage differ in other ways. For example, we load from memory to registers on the CPU, perform operations there, and then store the results back to memory by using byte addresses. This load/store technology is different from storage, where we tend to move data back and fore between memory and storage in large blocks, by using an API (application programming interface). •How can we build and use systems based on PM? •What would a system with storage, persistent memory and DRAM look like? •Do we need a new programming model to take advantage of PM? Kubernetes (k8s) is an open-source system for automating the deployment, scaling, and management of containerized applications. Kubernetes promises simplified management of cloud workloads at scale, whether on-premises, hybrid, or in a public cloud infrastructure, allowing effortless movement of workloads from cloud to cloud. By some reckonings, it is being deployed at a rate several times faster than virtualization. In this presentation, we’ll introduce Kubernetes and present use cases that make clear where and why you would want to use it in your IT environment. We’ll also focus on the enterprise requirements of orchestration and containerization, and specifically on the storage aspects and best practices. •What is Kubernetes? Why would you want to use it? •How does Kubernetes help in a multi-cloud/private cloud environment? •How does Kubernetes orchestrate & manage storage? Can Kubernetes use Docker? •How do we provide persistence and data protection? In the FCIA webcast “Protocol Analysis for High-Speed Fibre Channel Fabrics” experts covered the basics on protocol analysis tools and how to incorporate them into the “best practices” application of SAN problem solving. Our experts return for this 201 course which will provide a deeper dive into how to interpret the output and results from the protocol analyzers. We will also share insight into using signal jammers and how to use them to correlate error conditions to be able to formulate real time solutions. Root cause analysis requirements now encompass all layers of the fabric architecture, and new storage protocols that usurp the traditional network stack (i.e. FCoE, iWARP, NVMe over Fabrics, etc.) complicate analysis, so a well-constructed “collage” of best practices and effective and efficient analysis tools must be developed. In addition, in-depth knowledge of how to decipher the analytical results and then determine potential solutions is critical. Join SNIA Solid State Storage Initiative (SSSI) Education Chair and leading analyst Tom Coughlin and SSSI member Motti Beck of Mellanox Technologies for a journey into the requirements and trends in worldwide data storage for entertainment content acquisition, editing, archiving, and digital preservation. This webcast will cover capacity and performance trends and media projections for direct attached storage, cloud, and near-line network storage. It will also include results from a long-running digital storage survey of media and entertainment professionals. Learn what is needed for digital cinema, broadcast, cable, and internet applications and more. You need to rethink your WAN to survive the next 5 years. We can help show you how. Think about it: half of your IT services come from the cloud, from folks such as Amazon Web Services, Google Cloud, IBM Cloud, Microsoft Azure and Office365, and Oracle Cloud. Mixing cloud and internal sources, you serve an increasingly scattered and mobile staff. IoT is turning the physical environment into both a provider and a consumer of IT services. Is the WAN you built for Client/Server really going to serve? No. IT needs to rethink its WAN and re-engineer the economics of wide-area networking. • Up-to-date cost and provider performance data for MPLS and Internet services. •What prompted the development of composable infrastructure? One of the great advantages of Hyperconvergence infrastructures (also known as “HCI”) is that, relatively speaking, they are extremely easy to set up and manage. In many ways, they’re the “Happy Meals” of infrastructure, because you have compute and storage in the same box. All you need to do is add networking. In practice, though, many consumers of HCI have found that the “add networking” part isn’t quite as much of a no-brainer as they thought it would be. Because HCI hides a great deal of the “back end” communication, it’s possible to severely underestimate the requirements necessary to run a seamless environment. At some point, “just add more nodes” becomes a more difficult proposition. Now, not all HCI environments are created equal, so we’ll say in advance that your mileage will necessarily vary. However, understanding some basic concepts of how storage networking impacts HCI performance may be particularly useful when planning your HCI environment, or contemplating whether or not it is appropriate for your situation in the first place. Modern data centers are tasked with delivering intelligent multi-media responses to real-time human interactions. Massive amounts of data are being churned and sifted by highly parallel applications, such as Online Data Intensive Services (OLDI) and Artificial Intelligence (AI), which historically required specialized High-Performance Computing (HPC) infrastructure. New advancements in high-speed distributed solid-state storage, coupled with remote direct memory access (RDMA) and new networking technologies to better manage congestion, are allowing these parallel environments to run atop more generalized next generation Cloud infrastructure. Generalized cloud infrastructure is also being deployed in the telecommunication operator’s central office. The key to advancing cloud infrastructure to the next level is the elimination of loss in the network; not just packet loss, but throughput loss and latency loss. There simply should be no loss in the data center network. Congestion is the primary source of loss and in the network, congestion leads to dramatic performance degradation. This presentation summaries work from the IEEE 802 Network Enhancements for the Next Decade Industry Connections Activity (Nendica). The Nendica report describes the need for new technologies to combat loss in the data center network and introduces promising potential solutions. 2019 will be the year of application explosion and extension of the datacenter’s edge as we know it. This massively distributed application environment is being fueled by digital transformation projects in hybrid networking, multi-cloud and IIoT. Do you have an architecture in place to support and future-proof your network in this new application-centric world? Join this webinar to learn how to develop a strategy that is agile, reliable and secure and by design. If you are involved in the digital transformation of your datacenter’s edge, this is a must-see educational webinar. Join our panel of experienced Vivit Local User Group (LUG) leaders discussing real world use cases of how to bring Micro Focus customers, partners and field marketing teams together to network, work through software issues, share best practices, and advance your career opportunities. Fibre Channel’s speed roadmap defines a well-understood technological trend: the need to double the bit rate in the channel without doubling the required bandwidth. In order to do this, PAM4 (pulse-amplitude modulation, with four levels of pulse modulation), enters the Fibre Channel physical layer picture. With the use of four signal levels instead of two, and with each signal level corresponding to a two-bit symbol, the standards define 64GFC operation while maintaining backward compatibility with 32GFC and 16GFC. When it comes to your infrastructure, the buzzwords and technologies are abundant: IaaS, software-defined, composable, cloud, and more. What does the future hold for the cloud infrastructure market and for IT Ops and DevOps teams? How will digital transformation and security continue to play a key role? Join this live panel discussion to answer these questions and more, and learn what should be top of mind for IT teams going into 2019 and beyond. - Containers, Kubernetes and serverless - the next wave of IaaS? - What is composable infrastructure and what does it mean for your data center, on-prem and in the cloud? - Should software-defined infrastructures and SDDC's still be top of mind for your tech teams? Why or why not? Scale-out storage is increasingly popular for cloud, high-performance computing, machine learning, and certain enterprise applications. It offers the ability to grow both capacity and performance at the same time and to distribute I/O workloads across multiple machines. This webinar is part of BrightTALK's Founders Spotlight Series. Join Kelly Harris, Senior Content Manager at BrightTALK and Bob Crews, Co-Founder and CEO of Checkpoint Technologies, as they discuss the ins and outs of founding a tech company. For datacenter applications requiring low-latency access to persistent storage, byte-addressable persistent memory (PM) technologies like 3D XPoint and MRAM are attractive solutions. Network-based access to PM, labeled here PM over Fabrics (PMoF), is driven by data scalability and/or availability requirements. Remote Direct Memory Access (RDMA) network protocols are a good match for PMoF, allowing direct RDMA Write of data to remote PM. However, the completion of an RDMA Write at the sending node offers no guarantee that data has reached persistence at the target. This webcast will outline extensions to RDMA protocols that confirm such persistence and additionally can order successive writes to different memories within the target system. The primary target audience is developers of low-latency and/or high-availability datacenter storage applications. The presentation will also be of broader interest to datacenter developers, administrators and users. The recent data explosion is a huge challenge for storage and IT system designers. How do you crunch all that data at a reasonable cost? Fortunately, your familiar SAS comes to the rescue with its new 24G speed. Its flexible connection scheme already allows designers to scale huge external storage systems with low latency. Now the new high operating speed offers the throughput you need to bring big data to its knobby knees! Our panel of storage experts will present practical solutions to today’s petabyte problems and beyond.